LACK OF INSPIRATION ABOUT WHAT TO WERE? Do not worry, we have put together a great mix of Sant Juan outfit inspiration for you. 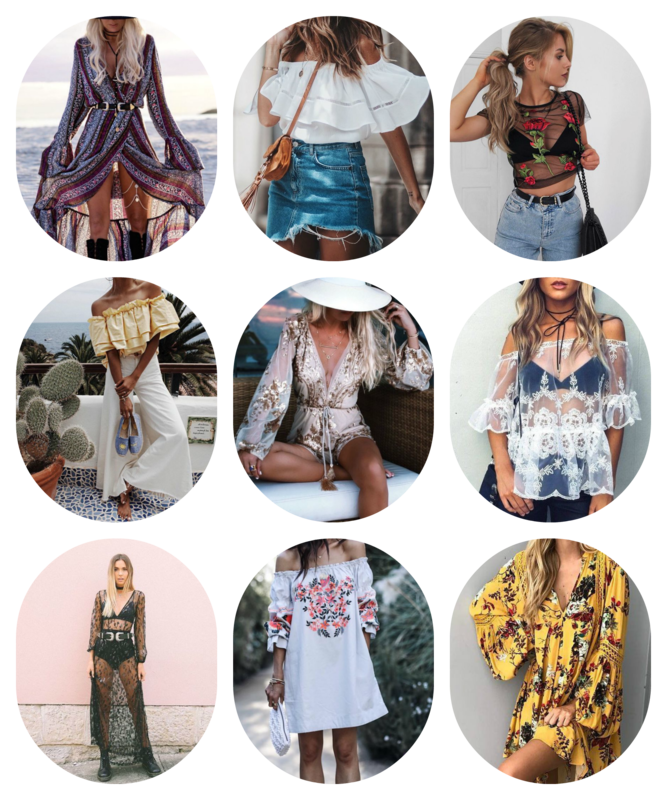 It does not matter if you are celebrating Sant Juan with a relaxed dinner with friends, bonfire at the beach or fancy party in a club , I’m sure you will find some inspiration for your outfit here! The shortest night of the year and the official beginning of summer is here! Sant Joan festival or “La Nit de Sant Joan”, the Spanish midsummer, is celebrated on the 23rd of June and continues to the 24th of June, which is “Saint John’s Day” and a public holiday in Catalonia and Spain. Sant Juan is one of Barcelonas biggest parties , you can either organize your own party with friends and family or join a party in one of Barcelonas many clubs. 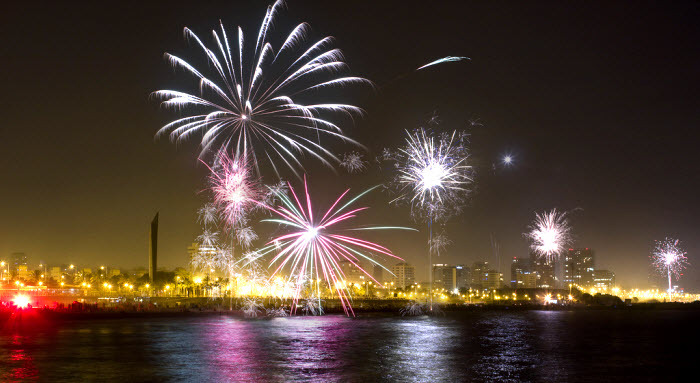 A lot of people, around 70 000, also spends Sant Juan on one of Barcelona’s beaches, a nice way to see the bonfires and fireworks ! Food and drinks is a very important part of Sant Juan, if you want to be traditional you should go for Coca & Cava . Coca is a dessert brioche cake which you can enjoy with Cava, sparkling vine from Spain. Personally, I know I’m going for this perfect combo! This celebration is an old tradition and has a lot of elements , where fire is the most important one, which explains the fireworks and bonfires. According to traditions will “The Flame of the Canigó” or Canigó’s flame light bonfires all over Catalonia. This year it’s 50 years since ” La Flama del Canigó” first arrived in the city, which makes this year’s Sant Juan Night extra special. Water is also an element of Sant Joan, according to legend and tradition a swim will cure ails, aches and pains. 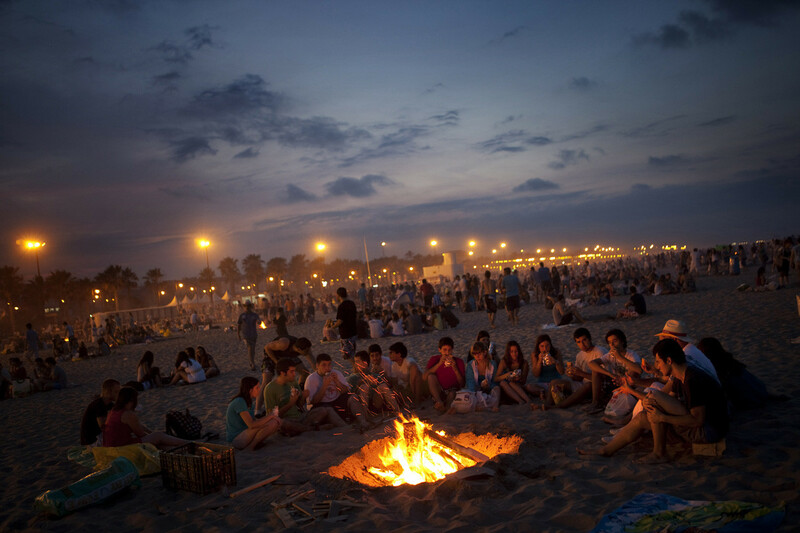 If you celebrate this festival on the beach, and it feels like a swim on mid-night, you will not be the only one. Legend says that on the night of San Juan herbs are one hundred times stronger than usual. Thyme, Rosemary and Verbena are collected and eaten during this event. The summer is really hitting Barcelona and it’s time to look over our summer wardrobe . Which is the summer trends you need to know, we hear yellow and a wow-factor is something to strive for this summer. This small piece of clothing is something we’ve seen a lot of on this spring runways. And what could be more perfect for the hot weather of Barcelona than a mini top to go with a pair of high waist, thin and loose pants or a high waist skirt? And why not choose a patterned fabric, for example flowers, which is something you will see a lot of this summer. I’m definitely going to wear an outfit like this! The cold shoulder is back, last summer everybody was all about the shoulder-tops and dresses. This summer everybody should be all about the one shoulder tops and dresses . 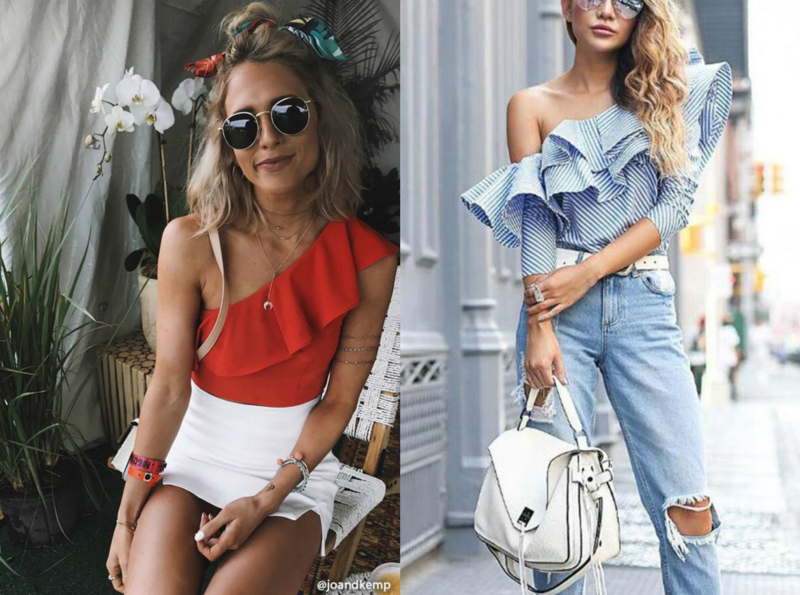 Another trend this summer is flounce clothing , choose a flounce one shoulder and you’re good to go! This is another summer trend that we’re so happy that’s here on the hottest summer days . A see through dress is a perfect cover up after a day at the beach or why not outfit during a night out on town. Choose a piece of clothing with embroidered flowers and you have two big summer trends in one. This summer the heels are getting lower and we see a lot of “oldies” coming back, like platforms, kitten heels and socks in sandals. Personally I’m quite happy about this! Even though I like the really high heals it’s safe to say these ones are much more practical and comfortable! AND their really good looking too! Lastly, this summer yellow is making a comeback . We have seen this bright color on many fashion shows this spring, and honestly, what a better color to match your tanned skin and the hot weather. HAVE A GREAT SUMMER FILLED WITH FASHION ! Between the 26th and 30th of June one of the most spectacular fashion events takes place in Barcelona. It is time for 080 Barcelona Fashion’s 20th edition. 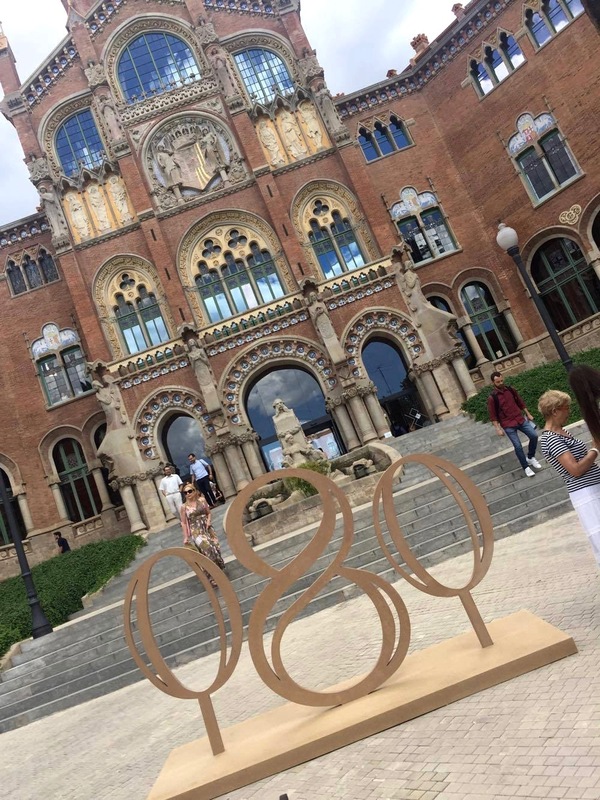 This will be celebrated by organizing the event at the beautiful Sant Pau Art Nouveau Site. Additionally, not only will there be the usual fashion shows and parallel activities, every night when the shows are over the iconic architectural complex will host performances, concerts and presentations, all as a part of the 20th anniversary celebration. One of the goals with 808 Barcelona Fashion is to strengten Catalonia and the city of Barcelona as a benchmark for creativity and innovation as well as design generation and projection in the fashion industry. The event starts of at 11.00am, the first fashion show is by Little Creative Factory, they are followed by Bobilo. After these two shows is it time for the 080 Barcelona Fashion opening. The opening is held at Pavelló Sant Rafael. During these five days over 30 brands and fashion designers will show their new collections. There will also be photoshoot competitions, fashion markets and exhibitions. For more information and the exact schedule, have a look at 080 Barcelona Fashion’s webpage. Have a look at this video to get an overview of 808 Barcelona Fashion in Januari 2017. I my self are really exited for this Fashion event in Barcelona. The fashion market is something I definitely will pay a visit to, hoping to find something nice to extend my summer wardrobe with. When it comes to the fashion shows and brands MIQUEL SUAY is one that caught my eye with their beautiful wedding dresses. Others are MARIA ROCH and GEMA SACH, two brands with more casual clothing. I really like the patterns of the GEMA SACH clothing. One particular item that i also like is TORRAS leather shirt. Lastly, I am really looking forward to see the shows of TEXELL MIRAS and BRAIN&BEAST, two brands that really thinks outside the box.